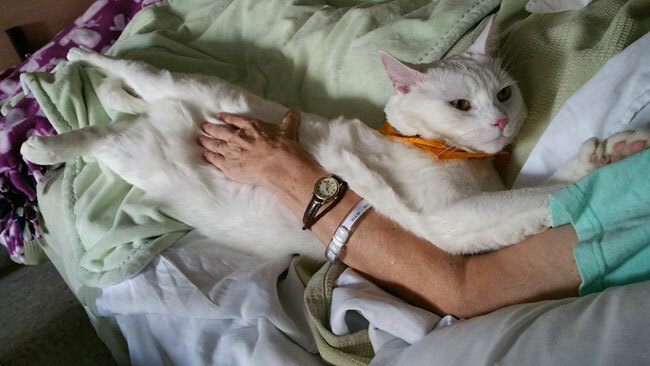 Truman was emaciated when rescued from the streets by a good Samaritan and taken to an animal shelter where he was adopted by Mary Moses Kinney. It was a veterinarian who suggested that because of his super calm temperament and easygoing personality, Truman would make a wonderful therapy cat. Truman, she said, is friendly, patient, confident, gentle and at ease in all situations. He enjoys human contact and is content to be petted and handled. Children, in particular, enjoy hugging Truman while adults are usually happy to simply pet him. When on the job Truman has an innate sense of going to those who need him the most. Last year when Truman was sick and had to take a break from therapy work, he received get-well cards from his many friends at Jewish Senior Services who missed his visits. Animals registered through the Pet Partner program need to be at least 1 year old. According to the organization, this age requirement helps protect a cat’s health as very young animals are more vulnerable to infection and aren’t necessarily up to the amount of touching and interaction a cat will receive on therapy visits. 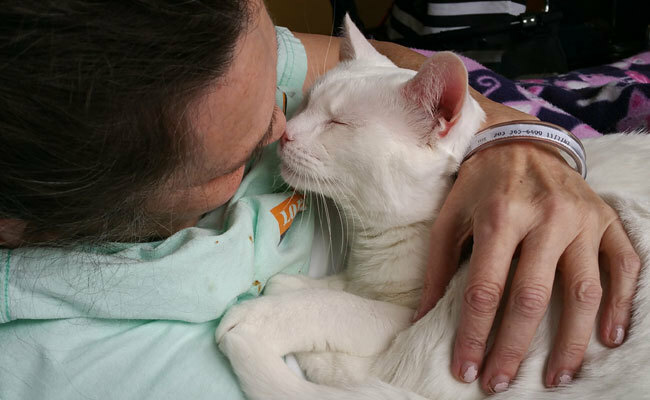 In addition, older cats have had time to develop their temperaments, learn the skills required to do therapy work, and establish a bond with their handlers. Therapy cats need to have a calm friendly temperament. They should welcome interactions with strangers and must enjoy being petted and touched by people they don’t know. Therapy cats must be comfortable sitting and lying quietly beside strangers. 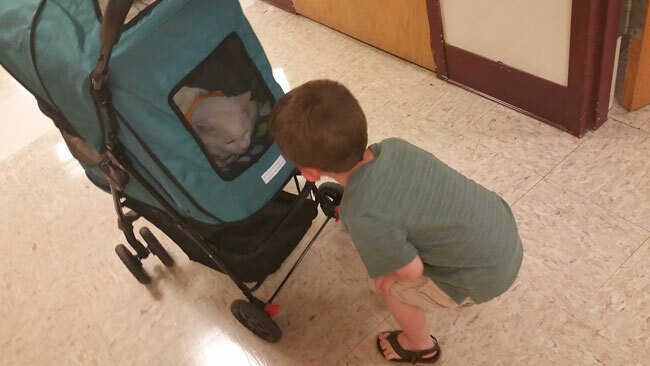 Since service work requires visiting different locations, therapy cats need to be comfortable traveling. Service cats need to be at ease around unfamiliar settings and medical equipment. Pet Partner therapy cats are required to wear leashes during visits for the safety of the cats and the people they are visiting. So, cats seeking registration in this program need to be trained to walk on a leash wearing either a collar or a harness. Before being registered with Pet Partners cats need to complete a health screening, which is confirmed by a veterinarian. Health requirements include an up-to-date rabies vaccination, proof that the cat is free of internal and external parasites and doesn’t currently have any easily-transmissible illnesses or conditions. In addition, the cat shouldn’t be taking any immunosuppressant medications and be in overall general good health. Pet Partners requires that cats in its program are not fed raw meat diets or treats. This requirement is part of the organization’s infection control protocols since animals eating raw meat present a higher risk of transmitting zoonotic infections to humans. Pet Partners offers more information about the registration process, including an overview of requirements and fees on its website.